Sugar, Semolina, Milk solids, Chili, Salt, Garlic, Ginger, Cashew, Cassia, Clove, Cardamom, Bay leaf and Anti caking agent (E551). Heat 2 Tbsp of oil in a pan and sauté 1 finely chopped onion until golden brown and 2 Tbsp of ginger garlic paste for a minute. Grind 3 fresh tomatoes and add it. Cook until the raw aroma goes off. 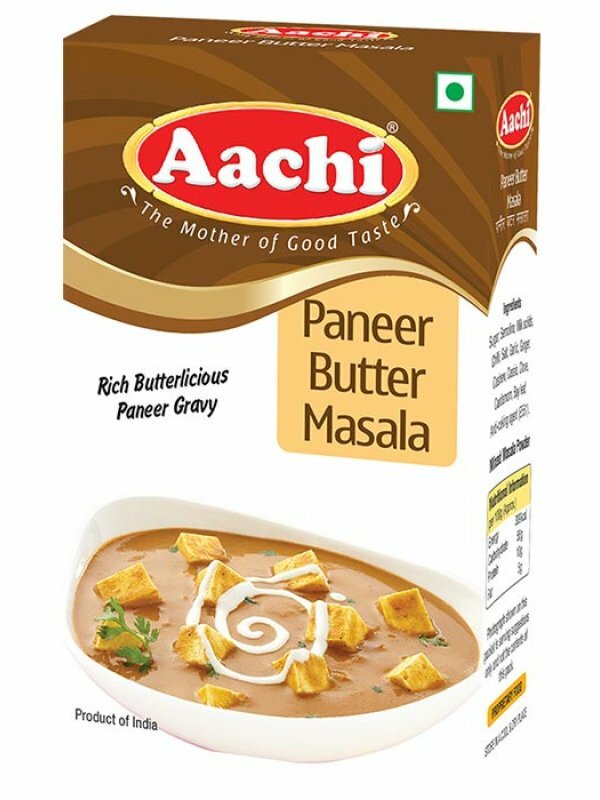 Add 2 Tbsp of “Aachi Paneer Butter Masala”, 200g of cubed paneer and sauté for 2 minute. Add 1 cup of milk and 2 tbsp of butter and cook for a minute.Salt can be added as per taste. Garnish with chopped fresh coriander leaves and serve hot Paneer Butter Masal Gravy with Naan/Roti.